The calendar says spring has sprung, but you wouldn't know it by the temperatures outside. 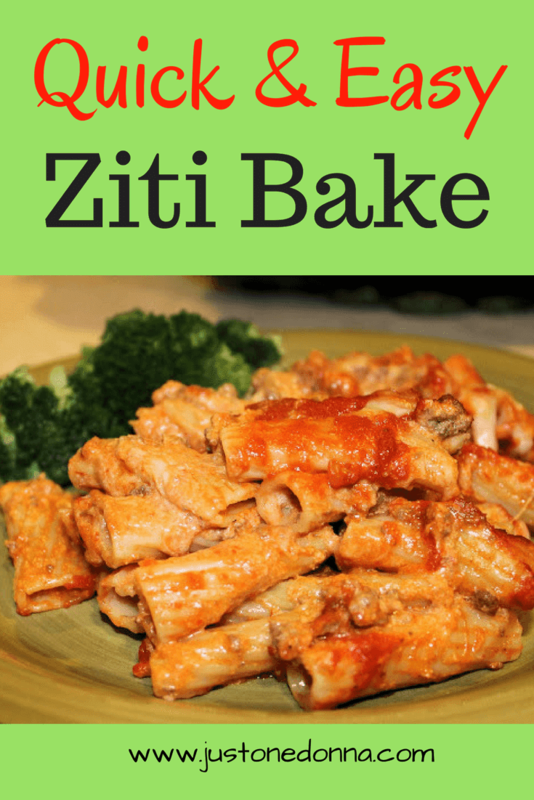 This ziti bake recipe is a delicious, hearty main dish perfect for a cold spring evening, or any time of year. It takes just a few minutes to assemble the ingredients and then forty-five minutes in the oven. You can make it ahead of time, even freeze it ready for the oven. ﻿﻿A ziti bake is a perfect make ahead, one pan meal. The ricotta cheese in this recipe makes the ziti bake creamy and yummy. Do you need a filling option for a family gathering or potluck dinner? This ziti bake is the answer. Add a colorful salad and some garlic bread and you'll be good to go. You can definitely make this ziti bake casserole with your own homemade tomato sauce, but this post is meant to give you a quick and easy option. Use my Italian Meat Sauce recipe, replacing the sausages and meatballs with the ground beef for a delicious homemade option. I love to use ziti with ridges for this recipe. The ridges on the pasta seem to hold onto the cheese and sauce for yummy goodness in every bite. Cook the pasta per the package directions. While the pasta is cooking, brown the ground beef in a skillet or dutch oven over medium-high heat, until well browned. Dark, crunchy bits on your beef will enhance the flavor of the overall dish, so be sure to let your beef get brown. Season with the salt and pepper. Drain the pasta. Add the ricotta cheese, the egg, half of the sauce, the Parmesan cheese and half of the mozzarella cheese to the browned beef. Stir to combine. Mix the pasta and the beef mixture together in the pan you cooked the pasta in. Stir well to coat the pasta with the sauce. Pour the mixture into a 13 x 9 inch baking pan. Spread the remaining sauce over the pasta. Top with the remaining mozzarella cheese. If you are making this dish a day or two ahead, cover with plastic wrap and refrigerate. When freezing, add foil and seal tightly. Preheat the oven to 350 degrees F. Bake for 20-30 minutes, or until hot and bubbly. When cooking from the refrigerator you'll need to bake longer. Serve with your favorite green vegetable for a satisfying meal.